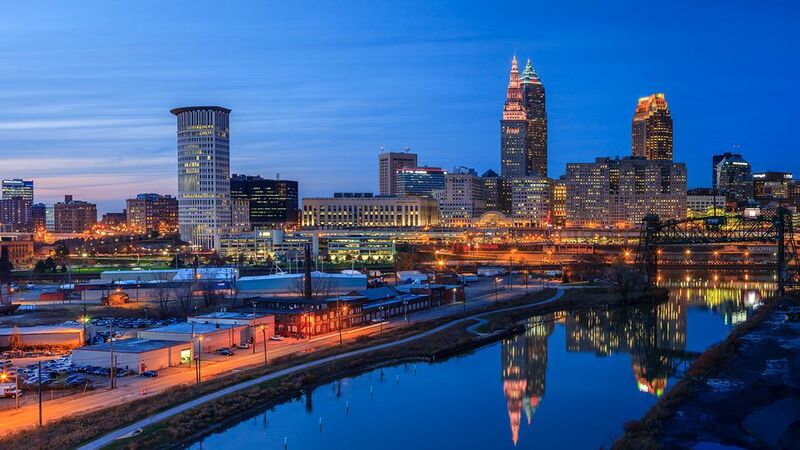 Cleveland, Ohio, and the surrounding communities on Lake Erie host dozens of festive New Year's Eve events, from family-friendly gatherings to classical concerts, from restaurant seatings to dinner cruises. More traditional late-night party venues turn up the tunes with DJs or live bands and live feeds to the ball drop in New York City. If you live in the area or are visiting for the holidays, make sure to plan ahead for the best New Year's Eve festivities. The celebration carries over to the next day when you book a New Year's Eve package at the Lodge at Geneva State Park. You can choose tickets to the New Year's Eve ballroom event or an all-access pass to the party. The ballroom package includes tickets to the New Year's Eve gala on December 31 from 6:30 p.m. to 1 a.m. It includes a one-night stay, a full buffet dinner, live entertainment, a five-hour open bar, champagne toast at midnight with a ball drop, breakfast on New Year's Day, and a late checkout at noon (especially nice for those nursing hangovers). The gala has a flashback 60s and 70s decade theme, so don't forget your retro costumes. The all-access pass offers everything above as well as a VIP experience at the Horizons Restaurant, including a sit-down dinner at from 6 p.m. to 1 a.m. and a DJ dance party. Usher in the new year at a black-tie-optional event with lavish dining, endless cocktails, and non-stop dancing at the annual Lago Custom Events NYE Soirée in Cleveland. The theme for New Year's Eve 2019 is Moulin Rouge. The 9 will host a New Year's Eve party in downtown Cleveland's stylish hotspot. For the 2019 celebration, it will have an old Hollywood glam theme with complimentary beer, wine, and craft cocktails as well as hors d'oeuvres. An all-night dance party and DJ will keep the evening upbeat as will the champagne toast when the clock strikes twelve. Tickets to the event cost $150 per person. Ties are optional at this black and white affair, but you can still dress to the theme in casual mode. Music and dancing with the Fontaines follow a 12-course tapas-style meal with, you guessed it, North 42 Degrees Estate Winery pairings. Top hats and flapper dresses fit the style of this Great Gatsby-themed party at 2nd & High Social House in downtown Cleveland. Admission includes beer and wine, passed appetizers, a champagne toast, entertainment, and a Gatsby costume contest. Ring in 2019 at the Barley House with legendary Cleveland DJ EV. This late-night party starts at 10 p.m., and admission includes open bar, finger-food buffet, Champagne toast, party favors, a light show, and confetti drop. Complimentary New Year's Day brunch with your New Year's Eve ticket. Don your best '80s attire and get to Wilbert's Food & Music downtown, where DJ Smarky Mark will cue all of your '80s favorites. General admission includes passed appetizers all night, three drink tickets, a Champagne toast at midnight, a late-night pizza buffet, a light show, and entry into the costume contest. Science geeks unabashedly celebrate New Year's Eve with an intellectual twist at the Bill NYE Bash held at the 16-Bit Bar + Arcade in Lakewood. No cover charge (though space is limited) to enjoy Bill Nye-inspired cocktails and a Science Guys marathon, plus the chance to win a hyper-colored, limited edition Bill Nye t-shirt.